Ronco del Gelso’s wines belong in the top tier of their respective categories. The Pinot Grigio Sot lis Rivis is an especially noteworthy white that once again proves that Italy’s best examples of its oft-maligned yet incredibly popular Pinot Grigio can be world-class drinks. Like all the estates in Italy’s Friuli Venezia Giulia’s Isonzo appellation, Ronco del Gelso is not especially old. Viticulture was always very important in this area (dating back to Roman times), but the estate was founded only in 1972. Modern winemaking in Isonzo really began only in the 1970s. Ronco del Gelso is one of the many examples of the “new wave” of Friulian producers that have appeared on the scene over the last few decades. I often wonder just how much wine-lovers know about the history of some of Italy's winemaking regions. Their history is telling and often provides a useful perspective in appreciating what they are about today. For example, it's a miracle just how far Friuli has come in a relatively short time, and how important it is in its role as one of the economic engines that drive Italy's economy. 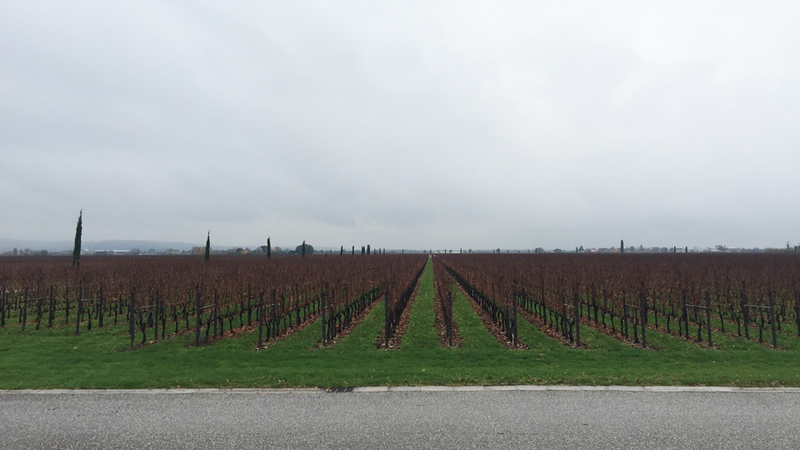 Friuli is world famous for its wines and successful estates, but it wasn't always so. For example, not many might know that Friuli was the site of a major earthquake in May 1976 (6.5 on the Richter scale) that devastated areas north of Udine, leaving over 900 dead and 45,000 homeless. The whole basin of the Isonzo river was hit, going as far into Slovenia on Italy's eastern border. But the Isonzo river was also the scene of an almost endless series of fierce, gruesome battles during WWI. An unbelievable twelve different battles were fought on the Austro-Italian war border from June 23, 1915 to November 7, 1917 that are now collectively known and numbered as the "La Prima Battaglia dell'Isonzo, la Seconda Battaglia dell'Isonzo, ..." (which translates to the First Battle of the Isonzo, the Second Battle of the Isonzo, and so on…right down to the Twelth Battle of the Isonzo, if you can believe that). This last, twelfth, battle is better known as the Battle of Caporetto, which ranks, and is sadly famous for being, the single worst defeat in Italian military history. In fact, it is now a common Italian way of saying, when things go poorly (from the national soccer team losing a game badly to a business deal falling flat) that it was a "Caporetto". It is all the more impressive how Friuli and its people have always been able to bounce back from adversities. Today, Friuli is one of Italy's most industrious, prettiest and reasonably prosperous regions. Giorgio Badin and his Ronco del Gelso estate embody the industrious spirit and resilience of Friuli's people. 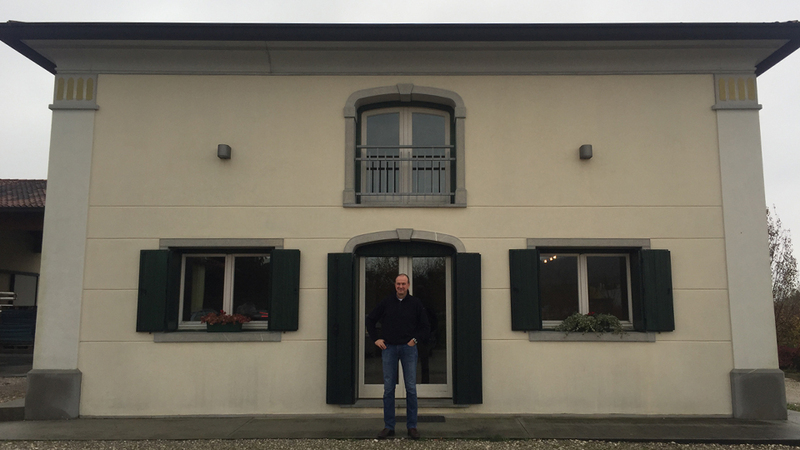 Upon taking over the family business, Badin, who studied viticulture and enology, immediately kicked things up a few notches by increasing plantings and the number of wines made. Badin bottled estate wines for the first time in 1988. Only 3,000 bottles were made that year, but 1988 can be viewed as the birth of the modern-day Ronco del Gelso winery. Badin is a talented man: almost all of his wines rank amongst the top in their categories, a rare feat for most estates. In my opinion, Ronco del Gelso’s Pinot Grigio Sot lis Rivis, the Friulano Toc Bas and the Malvasia Vigna della Permuta are among the regional benchmarks of the respective varieties. Today, the estate produces 150,000 bottles a year, of which 70,000 are of Pinot Grigio. Friulano and Sauvignon Blanc are also important sales-wise for the estate, and along with the Pinot Grigio, make up 80% of Ronco del Gelso’s production. Badin owns 25 hectares in the Isonzo denomination, which takes its name from the Isonzo river basin. Not surprisingly, the soils of the area are a classic gravelly-alluvial mix. There is only roughly 45cm of topsoil and then immediately below the gravel appears. Some sections are richer in limestone and others in iron (clearly the latter reddish colored soils are very easy to recognize, especially in the summer when it’s dry.) In general terms, soils on the cooler right side of the Isonzo river are referred to as Rive Alte and are a mix of mainly iron-rich clays and gravel with a little limestone. The Rive di Giare soils are located on the left bank of the Isonzo, closer to the sea, and are characterized by mainly white gravel, sand and are richer in limestone. All of Ronco del Gelso’s vineyards are located in the Rive Alte. Isonzo’s microclimate is somewhat more homogenous. Located at roughly the 46th parallel (like Burgundy, for example), Isonzo is characterized by a rather warm climate. For example, daily temperatures are on average 10°C higher than Burgundy. The Alps shield the vineyards from the cold northern winds, and the warm marine breezes blowing up from the nearby Adriatic sea also help create a very warm microclimate. Clearly, diurnal temperature variations aren’t as strong as in the Alps, for example, but are enough to ensure wines with crisp aromatics. Luminosity is also exceptional in Isonzo. The combination of warm temperatures and extreme light account for many of the characteristics of the wines, most of which are fleshy, tactile, rich and tend towards robust alcohol levels (14, 14.5 and even 15% alcohol levels are common even in Isonzo’s white wines.) It also rarely rains in Isonzo. 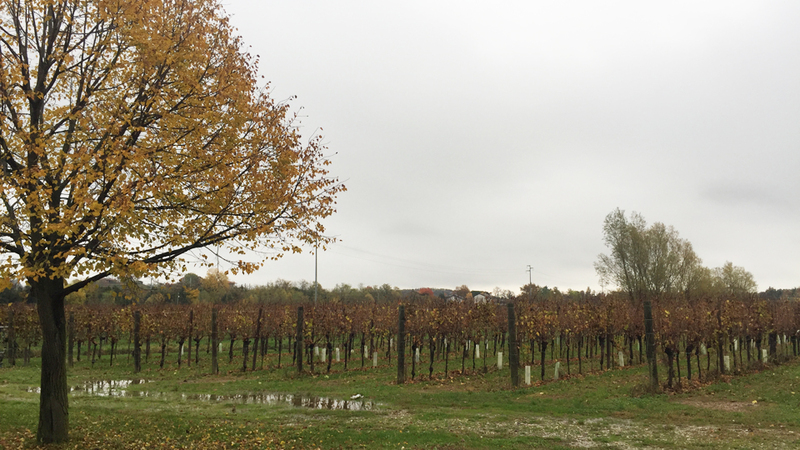 Unlike other areas in Friuli such as Grave, parts of which can receive up to 2000mm of rainfall a year, Isonzo is doused with only about 700-800mm of rainfall and this liquid refreshment is concentrated mainly in spring and fall. Taking into consideration the last decade or so, only 2010 and 2014 can be viewed as especially rainy vintages in Isonzo. In 1987 Badin planted Pinot Grigio vines sourced from Friuli’s world famous Rauscedo, where he worked briefly. Back then, only one Pinot Grigio clone was available that had been grown and developed in Friuli (the R6), and so, logically enough, that’s the clone Badin planted. I write “logically enough” not by accident: of course, there were other Pinot Grigio clones available at the time, such as those from Geisenheim in Germany or the Alsace clone 53 but these had never been studied much in Friuli’s terroir. We now know those clones are better suited to cooler climates and are characterized by tightly packed bunches, making them unsuitable for Friuli where they tend to rot very easily. In fact, over the years Friuli producers have largely ripped up their Alsatian clones of Pinot Grigio. Even worse, in Isonzo’s fertile soils the Germanic and Alsatian Pinot Grigio bunches tend to grow excessively and become quite large, which is one reason (though certainly not the only one) that contributes to the insipid and neutral nature of much of Italy’s cheaper Pinot Grigio wines. 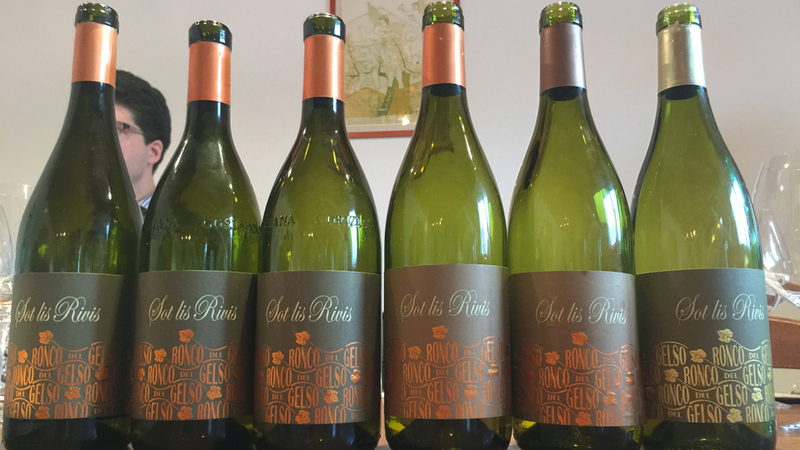 The Sot lis Rivis is made from Pinot Grigio vines that grow in the same area. Yields are a paltry 40hL/hectare. Badin tends to harvest as late as possible, on average never before mid-September. Badin likes to push ripeness in the belief that Pinot Grigio, when it nears optimal maturity, loses water but still ripens its polyphenols, thereby allowing for deeper, more concentrated wines. Fermentation takes place at roughly 19°C with selected yeasts. Badin hyper-oxigenates the must for 30 minutes before decanting the wine and then ages it in large 25hL used Slavonian oak barrels prior to bottling. Badin also used to do partial malos but has stopped (beginning with the 2010 vintage) in an effort to make more vertical, less opulent wines. “Because Isonzo is a relatively hot viticultural area, there’s not much malic acid in the grapes to begin with, and so, over time, I understood there was no need to do a malolactic at all” he remembers. The Ronco del Gelso Pinot Grigio Sot lis Rivis is not especially easy to judge when young. Though steely and precise, it seems easygoing and straightforward, and its quality is typically underestimated in its youth. With age, the wine picks up weight and becomes surprisingly complex, rich and creamy. Most of all, I admire the Sot lis Rivis for its precision and the rich, tactile mouth-feel it develops. While the oak confers an aromatic touch that is not typical of Pinot Grigio, at least in the case of this specific wine, where the oak is very judiciously used, it adds both complexity and interest. I also like the fact this wine nicely showcases the sweet ripe fruit that is the characteristic of all of Isonzo’s white wines (as opposed to the menthol trait more typical of the Collio, for example). But most of all, Sot lis Rivis is but one of many very fine Italian Pinot Grigio wines that helps put to shame the commonly held notion that all such wines are neutral and inconsequential. The wines in this tasting were sourced directly from the estate and tasted in late September 2016.